Although many of us are huge advocates of recycling, there’s no denying that typical recycling bins can become a huge sore, and can be quite distracting in an otherwise beautiful environment. 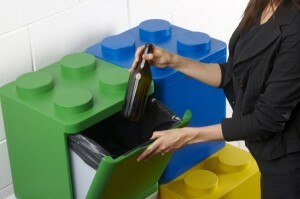 Well the team at the Italian company Flussocreativo aimed to solve this issue by creating recycling bins that didn’t sacrifice form for function . The team looked to the classic LEGO block for inspiration, and developed the Leco. Not only do these Lecos look like LEGOs, they operate like them as well. There are four different size containers in all including smaller ones for aluminum and glass recyclables alongside two larger bins for paper and plastic. They can be stacked together in several different ways to suit your needs.